"Let him go, stay on the leader"
In a scene reminiscent of the trench run in Star Wars, I pilot my tie advanced down the narrow sidewalk while my wingmen cover me. Although this photo wasn't taken deliberately to mimic a moment in cinematic history, it sets the tone for how Star Wars affected my life. It all started with a trip to "A&P", a grocery store in Williamsburg, Va. There I laid eyes on a bin (most likely with a 12-back header) of Star Wars figures, and convinced my parents to buy me Darth, C3P0, and R2. And so it began.. 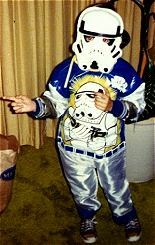 When Star Wars was first released in May, 1977, I wasn't even 4 years old yet so my memories of that time are shady at best. This stunning art-noveau self portrait was brilliantly realized in the summer of 1978. 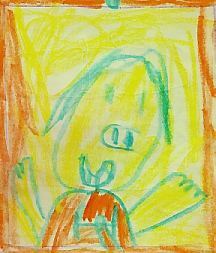 Despite noticing the obvious artistic talent at such a young age, you can see how Star Wars was constantly on my mind. I don't recall ever owning a shirt with a Tie Fighter on it, but it's obvious that I wanted one. I do remember being mesmerized by the movie, and living the adventures of Luke Skywalker and Co. through the various products that were released; namely the Kenner toys. I considered it sacriledge if I didn't get Star Wars when gifts were headed my way. This montage consists of various birthdays and Christmas mornings where my wish lists came true. From left to right is the Tie Fighter, Imperial Troop Transport, Taun-Taun, PDT-8, and Dagobah. December 25, 1978 was the perhaps the best Christmas of my life. 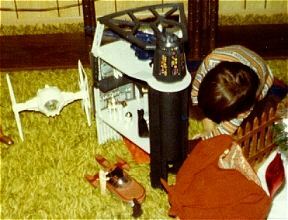 Finally after many requests, a Kenner Death Star Playset found its way into my possession. Santa was kind enough to fill it with figures...even those that I had damaged or lost weapons to from previous play such as Luke and Darth. From that point on, my father made sure that I'd never lose weapons again by gluing the guns into the figures hands. I still have those figures today in a display case. As you can see in the picture, I really liked to play with my toys. Many figures met their demise in the trash compactor. I don't think there was any greater feeling than obtaining a new Star Wars toy. I was proud of my toys back then, even to the point where my parents had to forbid me from taking them outside because I liked to show them off too much to my friends. My dad himself had a collectors mentality, so he made sure all my Star Wars were packed up and put in the attic when I finally outgrew them (temporarily of course). 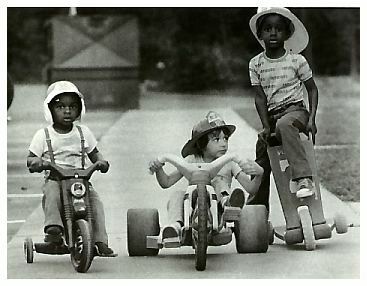 He even knew they'd be collectible someday, and even considered buying one of each to put down in new condition for me. He was so close!! Even today, a smile finds its way on my face when I acquire a long sought after piece for my collection. Will it even end? Who knows...but I sure hope not.